Driving to the Snow…the Journey of a Thousand Toilet Stops. Monday morning, the family said our goodbyes to the dog and the pile of bones I’d bought him as a guilt-laden compensation package and we left for our much anticipated trip to the snow. With about a 7 hour drive ahead, we would be staying in Jindabyne for 6 nights and skiing at Perisher in the so-called “Australian Alps” for 5 days before returning home via a night in Canberra. Just to put you in the picture, my husband and the kids are “skiers”. This means so much more than simply gliding down the mountain on what looks like a set of planks. Being a skier is something that grips hold of your heart, your soul, your psyche, your very being and there’s that fire. You can’t describe this kind of wild passion but you know it’s there when you look in their eyes. There’s that flame. You also know that as soon as they leave the slopes at the end of the trip, they’re already mentally calculating how they could possibly squeeze another run in this season even if they have to starve. Real skiers don’t care about food. They just want to get back out there again and Ski! Ski! Ski! Let me introduce you to my husband. Even before the ski season officially opens, he’s back onto Perisher’s webcam checking out conditions and watching the snow reports like an over-zealous hawk. I even caught him checking out the mountain in summer. There was nothing but grass. Call it desperation or determination, either way, he’s hooked. Miss skiing on the slopes. Our kids have also caught the bug. Last year, after spending a full day at ski school, they’d go for a few runs down the Village 8 with their Dad and they’d also visit me over on the Magic Carpet. I couldn’t believe their energy. After all of that, they even managed night skiing as well. Unstoppable! They were completely unstoppable!! It is hard not to be drawn to such a mighty flame and thanks to the Disabled Winter Sports’ Association and my magnificent instructors, skiing has become more than a possibility for me. I was actually able to fly out of the nest and spread my wings, even if I still remain a tentative fledgling. Before I started, I thought I might be in a sit chair or have some other form of adaptive equipment but my instructor got me out there on standard skis. We just took things nice and slow and appreciated my smaller engine. My instructor & I. Thank goodness you don’t have to take on the mountain alone! Despite my success last year and my love of the snow and a good holiday, I was still apprehensive. As much as I wanted to be a part of our family holiday and not dampen their enthusiasm or to be “difficult”, my fears were mounting up layer up on layer like a huge, enormous cake with cherries and even sparklers on top. Although I might have been a picture of calm serenity in the front seat of the car with all of my home-baked goodies under foot (including a double dose of Chocolate Caramel Slice), beneath the surface, storms were raging and it was raining cats and dogs. Actually, that’s a bit of a euphemism. I was actually busting for the loo. Indeed, I couldn’t stop busting. So you could call our drive: “The Journey of A Thousand Toilet Stops”. We had had 4 toilet stops before we’d even driven through Sydney. As if needing to go wasn’t bad enough, trying to find a toilet on a motorway is hellish and we went on an almighty detour through Quakers Hill which probably added an hour to the trip. By this stage, I’m sure my poor husband was starting to feel like a stop-start learner driver slaughtering the clutch. I could hear him thinking: “Why did she have to have that third cup of tea before we left? Did anyone bring a cork?” Frequent toilet stops aren’t anything new but even for me, this was getting ridiculous beyond ridiculous. That was how I realised just how nervous I was about going skiing again and it wasn’t only a fear of going skiing either. My wretched auto-immune disease has flared up on both of our previous family ski trips and we know Murphy’s Law all too well. Family Portrait 2012- I had serious breathing troubles climbing up the hill but I’ll do anything for the shot. On our first trip back in August 2012, the day before we were due to leave, we had a mad panic dash to Emergency. The pathology lab had called me directly at home saying my blood tests showed I was at high risk of having a heart attack. That news hit us like a bolt of lightning. I mean we all want to be able to say our goodbyes. Get our affairs in order and at the very least ensure we are wearing one of our better pairs of undies not to mention a decent bra and definitely not the holy singlet. I’m sure you, like me, also have a lot of photos to sort out as well. To say it is traumatic to watch your entire life flash passed like that is a huge, enormous understatement…especially when you have young kids!!! There we were also about to go on the ski holiday of a life time and the children were so excited about seeing snow for the first time and even building a snowman. Having a heart attack wasn’t part of the plan. The kids with our snowman 2012. Fortunately, that was a false alarm but my auto-immune disease had flared up and the prednisone went up. I was also told to have blood tests while we away and I’m sure you can appreciate how I felt about that. Last year, not to be outdone by the previous year, I caught a chest infection at the snow which ultimately brewed into a life-threatening case of pneumonia. Lung CTs for that showed that my auto-immune disease was now attacking my lungs as well. I could tell just by looking at my doctors’ faces that I was as good as doomed. Yet again, my life was whooshing past like a bullet train but yet again, I had a reprieve. I was off for 7 sessions of chemo and around 3 months shut in the dark. When you’re having chemo, you can’t go out in the sun without covering up every millimetre of skin. 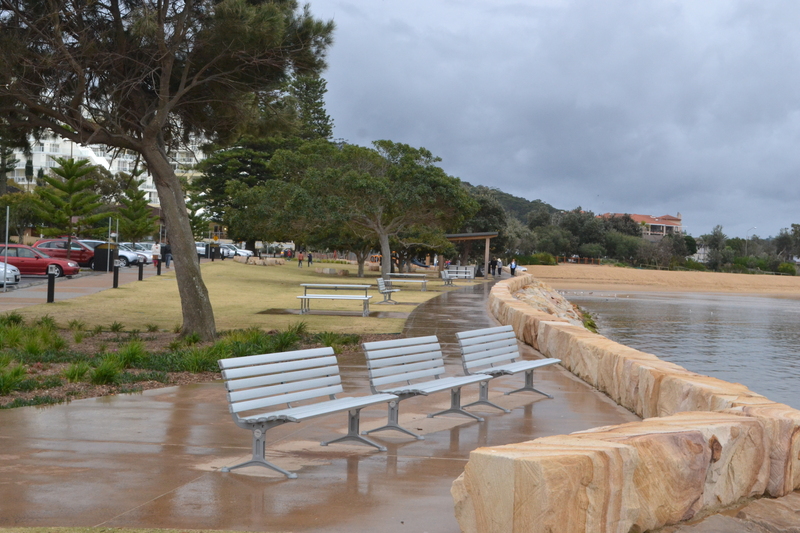 You can just imagine how I loved that living near the beach in the middle of a gorgeous Australian summer. At the same time, it wasn’t forever and chemo was giving me my second wind. Thankfully, chemo worked and the auto-immune disease is in remission again but it was a close call. So you can understand why I was more than just a little apprehensive about going skiing again. But going skiing wasn’t just something the rest of the family wanted to do. It was also my dream. A dream I had worked hard on last year. You see I’d had this big light bulb moment when the rest of the family had been skiing without me the year before. As I watched the Paralympic ski team training on the slopes, I decided that instead of climbing up a mountain like so many who are overcoming a health challenge, I was going to ski down the mountain instead. This became a personal goal to “turn my mountain around”. Moreover, skiing down the mountain was going to be the grand finale to a motivational book I was working on which was based on the serenity prayer…working out what I could change and what I couldn’t change in my life and I guess also reaching some kind of acceptance of how this panned out. Unfortunately, the auto-immune disease turned out to be the turn in my side and it really did rattle the serenity prayer. Of course, I wasn’t about to “accept” that the dermatomyositis was going to get me. Serenity or no serenity, I was fighting back! Grr! At the same time, this significant setback put the book on hold. It’s not that the book had to have a happy ending but that wasn’t the story I was planning to tell. I was getting better and certainly wasn’t getting worse or even dying. That could be someone else’s story. It definitely wasn’t going to be mine! So instead of skiing down the mountain and living happily ever after, I had skied smack into a metaphorical brick wall. For almost a year now, so many aspects of my life have been on hold. I am still in the process of picking up the scattered pieces. Don’t get me wrong. I am very thankful…exuberantly thankful to be where I am but there has been so much angst and frustration not to mention the grief and anguish our whole family has been living with given my precarious health. Yet, you would walk past me in the street and not even blink an eyelid. I look so normal and I’m usually smiling, laughing and squeezing the zest out of life. You’d never know!! Understandably, this meant that while the rest of the family was uber-excited about going skiing, I was still struggling to get my mojo back and I very much felt like I was chasing someone else’s dream and not catching up. That’s one of the difficulties with pursuing someone else’s dream. As much as you might be willing to extend yourself, try something new or simply support someone you love who is pursuing their passion, at best you are struggling to keep up. At worst, you are completely and utterly lost and accused of “being difficult”, “dragging the chain” or even sabotaging absolutely everything just because you can’t find the gear stick and are perpetually stuck in park. I was having trouble packing and Geoff was accusing me of getting side-tracked baking before we were ready to go but I knew how to bake. It was safe, comforting, routine. Moreover, baking some special treats for our holiday was my special contribution straight from the heart. I was baking Chocolate Caramel Slice and Choc-Chip Cookies. I could do that. The whole ski thing was so far beyond me. I simply couldn’t move myself into gear. But as they say, time heals and that’s the benefit of a very long drive. Eventually, even this non-stop bladder had to run dry. By the time we finally reached Cooma and I was trying on my ski boots, I was actually starting to get excited. My ski boots were red…just like Dorothy’s slippers in the Wizard of Oz.Yet, despite this new found excitement and a sense that perhaps I was finally starting to get with the program after all, a big part of me still felt like tapping my boots together and chanting: “There’s no place like home… There’s no place like home… There’s no place like home…” Oh to be magically transported back home to the warmth of my electric blanket, the comfort of my feathered dooner and a pile of fabulous books. Surely, it couldn’t get any better?!! Yet, just like Michelangelo saw David inside that historic marble slab, some special kind of x-ray vision perceived just enough of a skier buried deep inside myself to resurrect some faith. I just needed to chip away the fear and I would find those skis, the poles and even a helmet and goggles. What’s more I wouldn’t have to do it alone. I had my instructor and he’d already gone backwards down the mountain for me. By the time the car finally pulls into Jindabyne and as I inhale all that fresh mountain air, my fears have gone away. Hey, those mountains had better watch out. I’m back and I’m about to turn them around. 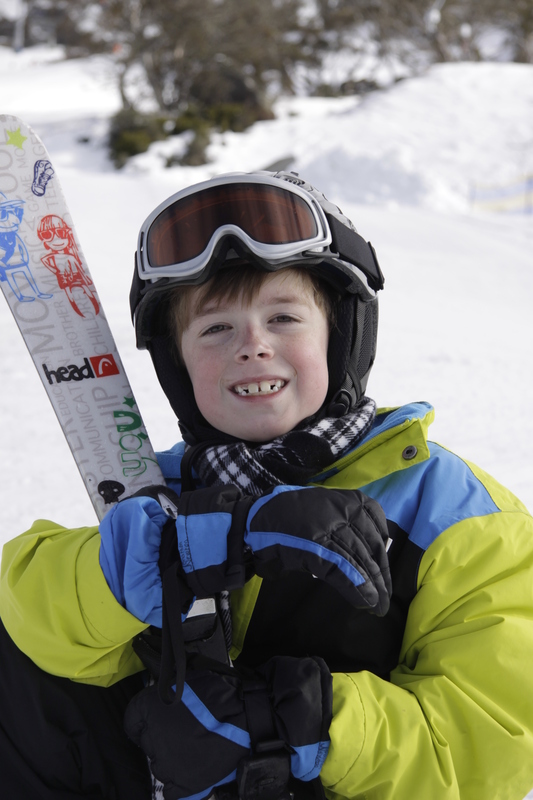 This entry was posted in Parenting, Skiing, Travel on August 29, 2014 by Rowena. No doubt, it comes as no surprise that we get very little snow in Australia and snowing itself is a rare, very exciting and even memorable event. Indeed, each and every snowflake is precious… so very, very precious!! Most of our snow, at least on the Australian mainland, is concentrated in the Snowy Mountains, which are part of the Great Dividing Range on Australia’s East coast south of Canberra. As most of our snow falls in this region, it is colloquially known as “The Snow”. You see, there isn’t much snow anywhere else apart from the odd freak dump and that usually isn’t skiable. It’s only good for snow fights and bragging rights. 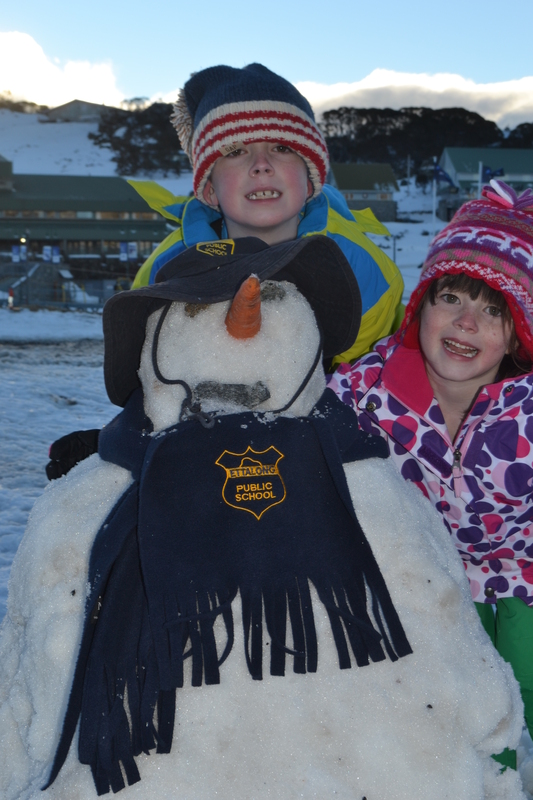 Yes, snow is so rare in Australia that being able to say you’ve touched or even seen real snow is something for kids to show off about. This lack of snow also explains our comparatively poor performances at the Winter Olympics. Although we first competed in 1936, we didn’t receive our first medal until 1998. As a nation of sporting champions, that speaks volumes. We simply don’t have sufficient access to snow to participate en masse, let alone compete. The Snowies culminate in Australia’s tallest mountain, Mt Kosciusko, which is something of a national embarrassment as far as tallest mountains are concerned. Looking more like a pancake than a jagged mountain peak, Mt Kosciusko clocks in at 2,228 metres above sea level. Obviously, this makes “Kozzy” little more than a pimple on the side of Mt Everest, which stands at a towering 8,848 m.
Yet, despite being so vertically challenged, some bright spark has decided to re-brand the Snowies as “The Australian Alps”. As a marketing person myself with considerable imaginative flair, I can appreciate a bit of hyperbole. However, when it comes to describing the Snowies as “alps”, somebody seriously needs to get their eyesight checked. Although our alps do have snow in winter, they’re nothing more than big hills. Actually, dressing our Snowies up as “alps” reminds me of a pre-pubescent teen strutting around in an F-cup bra with sport’s socks shoved down their front. For better or worse (depending on how steep you actually like your mountains), it’s going to take a lot more than a pair of football socks to turn the “Australian Alps” into anything like the kind of mountains Heidi calls home. No, that would take serious earth-moving equipment and even more dirt than you’d find in a British tabloid. Don’t get me wrong. Personally, I’m more than happy with our Snowies. As the saying goes, more than a handful is a waste and I certainly found even our relatively gentle ski slopes Everest enough. They are what they are. We don’t need to call them Alps just to attract tourists. After all, not every skier wants to fly before they can crawl! While there are a number of different ski resorts to choose from in both New South Wales, Victoria and also Tasmania, we ski at Perisher resort, which has a huge mass of lifts and trails sprawling in between Guthega, Blue Cow, Smiggins and Perisher itself. Most of the time, I stuck to the Magic Carpet although I skied at Blue Cow about 12 years ago and absolutely loved it. 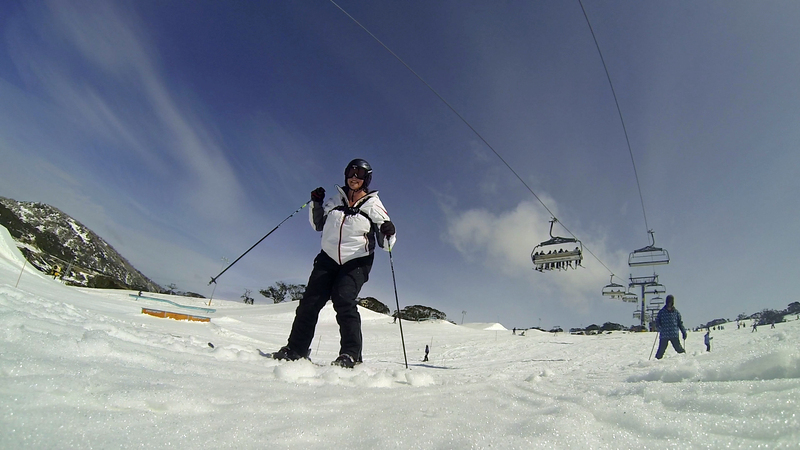 I have also skied down Perisher’s Front and Happy Valleys. 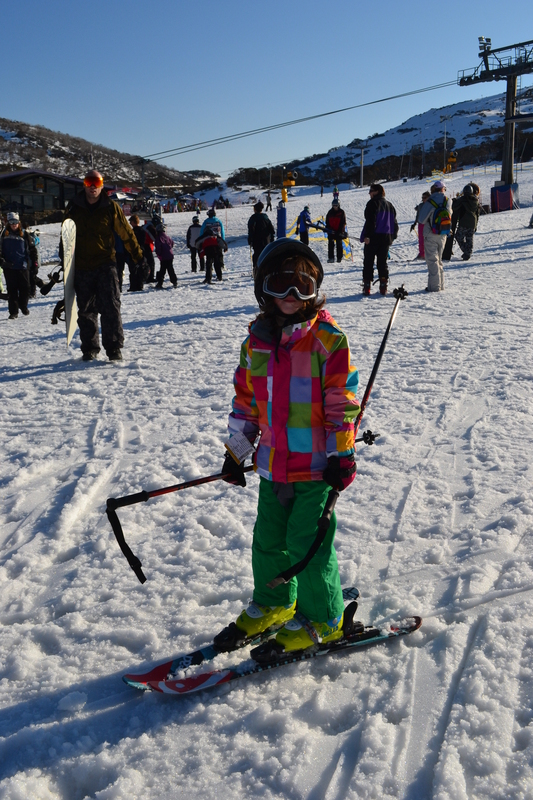 I have never skied in Thredbo but understand it has steeper slopes and hence doesn’t have quite so many young kids or rank beginners on the slopes. While I met a few people who flitted between Thredbo and Perisher, we find in easier to plant ourselves at Perisher. We save money buying 5 day lift passes in advance online and we get ourselves lockers for absolutely everything so we’re not lugging stuff to and from the car every day and can juggle things like cameras, snacks and walking shoes while we’re out on the slopes. Geoff who is obviously a much better and more experienced skier than me, loves Perisher because there is so much variety and you can ski around the resort trying different runs and says there is so much to explore. There are also 47 lifts, which makes a huge difference in being able to access a real variety of different runs. I imagine that this would be very desirable to more advanced skiers who don’t share my love affair with the magic carpet down below and actually venture out. Snow Gums at Mid-Station, Perisher. What the Australian ski fields might lack in altitude, we more than compensate for in beauty and unique character. 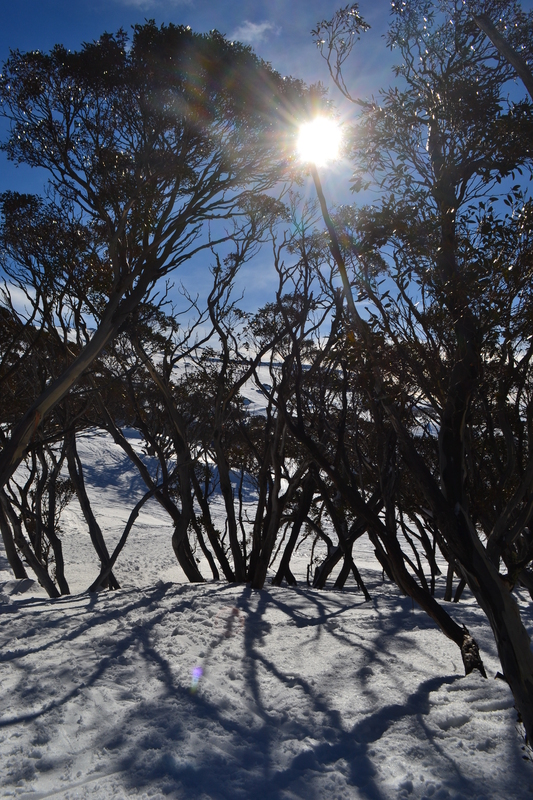 You see, our snowfields are home to the snow gum, a very tenacious yet beautiful tree which somehow manages to thrive in very adverse conditions and is so different to the firs you might experience overseas. I have to admit, however, that I didn’t take in much of the scenery while I was out skiing. I was too focused on my instructor’s skis and was deliberately not looking down. I didn’t want to freak myself out! 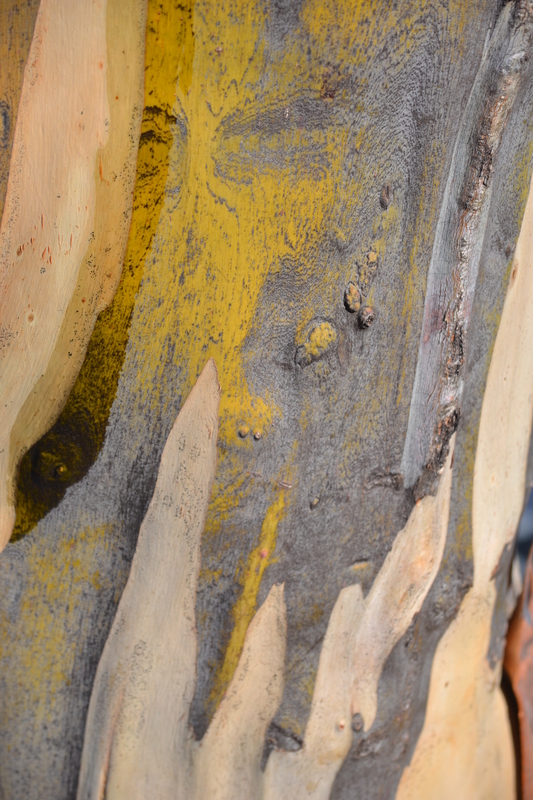 Close-up of the beautiful colours running through snow gum bark . What a beautiful palette! I don’t know if this is unique to our ski fields and we were also lucky with the weather but even in the very depths of winter, we can have deep azure blue skies and glorious warm sunshine. It is hard to believe but it was so hot and balmy we could have been at the beach. That is, as long as we had our ski gear on. Of course, it cooled down significantly after sunset but by day we had some truly glorious weather!! 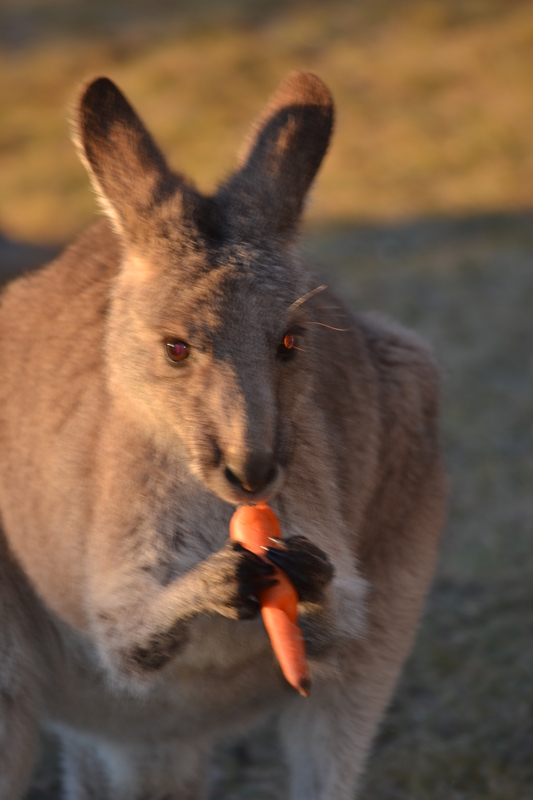 Kangaroo eating a carrot, Jindabyne. If you are looking for skiing kangaroos, I haven’t come across any as yet but I have definitely seen critter prints in the snow which might suggest they head out after dark. There are certainly plenty of kangaroos around the ski fields. Where we usually stay in Jindabyne, there are resident mobs of kangaroos which we’ve hand fed before heading out for a day’s skiing. They’re a real treat. Yet, although seriously outnumbered by just about every other sport in existence, Australia too has its mad, completely obsessed skiers. However, in Australia this obsession with skiing itself is almost superseded by a fixation with the snow reports and how many centimetres and hopefully metres have fallen. This is a very serious business and every skier tries to time their ski trip at precisely the right moment to experience optimum conditions. However, there seems to be no pattern from season to season. It’s all pot luck. This feels like a serious gamble when you have to fork out big money for accommodation months in advance and there are enough short seasons where you could easily blow your dough. Yet, these wrangles with the weather are no different to booking a summer beach holiday where there’s the usual threat of rain. 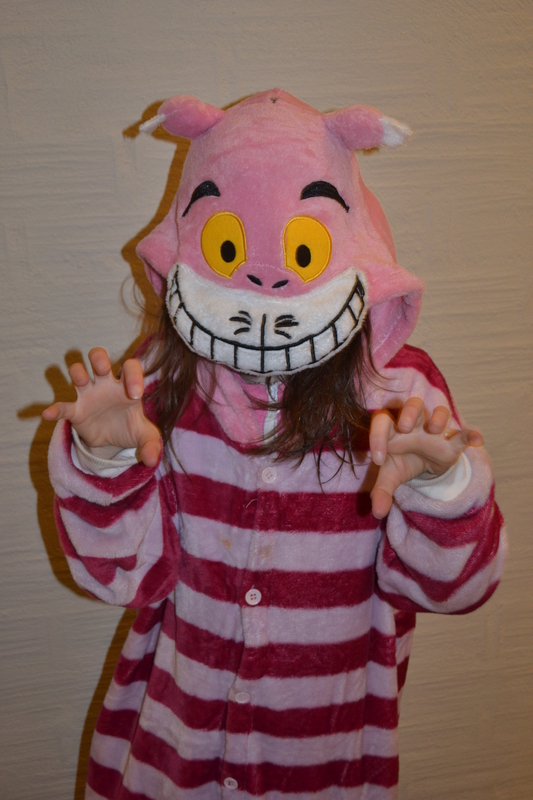 Even the Cheshire Cat was out there! While I have been talking about skiing, I must admit that there is another creature on the slopes and I’m not talking about all the cows, giraffes and other onesies lolling about. 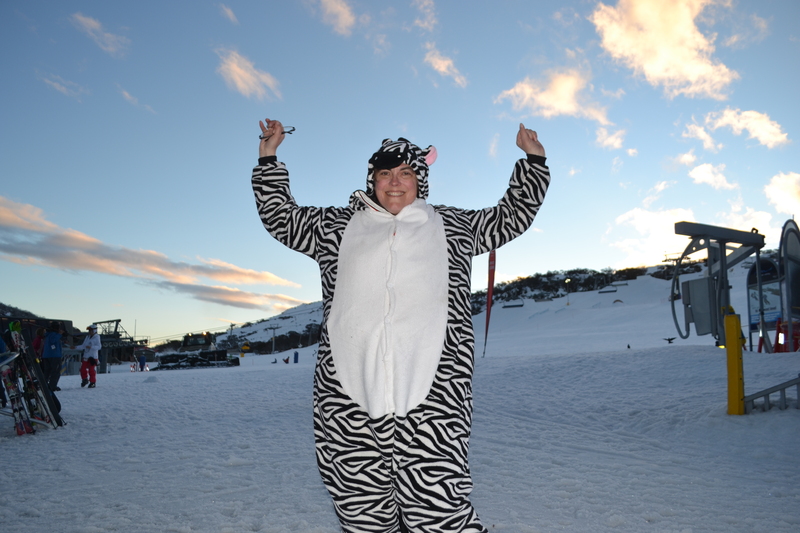 Wild Zebra Spotted on the slopes. No. I’m talking about snowboarders or “boarders”. As a skier and a beginner skier at that, I’m unable to elaborate much about them except to say that I’ve spotted boarders parked under trees and even grazing in the middle of “ski” runs. There are significant “hostilities” between skiers and boarders on the slopes, which I haven’t bought into. I am too busy focusing on my own skis and checking up and down the slope for hazards to get into anything peripheral. My main gripe is with the behaviour of doting parents on the magic carpet. The magic carpet is Perisher’s beginner ski run and you take the carpet up the top which is easier for beginners to manage than the t-bar or chair lift. The magic carpet is an area for all beginners, not just kids and certainly is not a reserved area for parents photographing their absolutely gorgeously cute beyond all measure little cherub with their state-of-the-art camera phones. I’m sure even royal photographers are less intrusive and don’t feel they have an ordained right to knock down learner skiers in their quest for the perfect shot. After ski school finishes, these parents gather at the bottom of the slope and I mean on the slope watching their little darlings and blocking other skiers from having a run. I was actually having a lesson during all this chaos and had three runs ruined by thoughtless parents and when you are paying potentially more than $3.00 a minute, you are understandably annoyed especially as some of these parents haven’t even paid for lift passes. Last year, we even saw a father photographing his 1 year old toddler in the middle of the magic carpet. This was really dangerous because even beginners can pick up a bit of speed but we can really struggle to stop and have trouble controlling direction. When you see a small child in your path, your natural instincts tell you to stay away. Not to hit it. For an adult to run over a child feels really, really bad even on the snowfields and even when the child’s very own parents have put them at risk. Yet, so many parents don’t seem to share my concern about the inherent risks. For some reason they become so one-eyed about their child, that they can’t see anything else. As I said, that can be very dangerous on the ski fields and even more so in the beginner’s area. Remember this is where the rank beginners are learning and while we might be able to ski down the hill, there are no guarantees we are going to stop. Skiing is a risky and dangerous sport and as much as I love photography, you do need to question whether a shot is worth the risk. Such tunnel vision has no place on a ski slope. There are also other activities peculiar to the “mountain”. While many might associate skiing with inhaling all that beautiful fresh mountain air and increasingly your physical fitness, smoking is an activity in its own right. I seriously struggled to breathe at times with the clouds of cigarette smoke looming in outdoor areas. Some smokers were courteous, but one bloke was pointing his cigarette away from his mates and practically stuck it in my mouth. I was young once myself and had the odd cigarette but these days I feel we all have a right to clean air. In keeping with this healthy snowstyle, you also seem to be able to fill up on beer as early as 10.30AM which is otherwise known as “beer o’clock”. These early starts aren’t just restricted to beer drinkers either. An older guy well into his 60s or 70s sat opposite me and pulled out a hip flask of whiskey around a similar time much to his wife’s horror. If you are a wife or perhaps it’s even your own father who stubbornly refuses to tow the line, but I’m you’ll appreciate just how difficult it can be to manage a naughty husband! My budget hot chocolate with a mountain of cream to rival Mt Kosciusko. While I might be sounding like some holier than thou prude, I wasn’t much better. Beer and cigarettes weren’t my thing but I had my own poison. No matter what, I always made it up to mid-station before 10.30AM for my budget $2.50 Hot Chocolate with its luscious swirl of thick, whipped cream and two molten marshmallows. It might not give you lung cancer but it could certainly block a few arteries. So you see, I’m not such a health freak after all! With hedonism of all kinds alive and well halfway up the mountain, who has any energy left for the après-ski? Sounds like a hot shower or even a long soak in the tub is in order along with an early night. Oops! That’s right. It’s only 10.30AM and I haven’t even got started yet! This entry was posted in Skiing, Travel and tagged Australia, beer, boarding, chocolate, fitness, health, parenting, Perisher, skiing, snow, snow boarding, snowman, travel on August 29, 2014 by Rowena. The interesting and often challenging thing about being part of a family is that you not only get to go on your own adventures and do your own thing, but that your family also takes you on all sorts of journeys to places you would never, ever consider going. As a result, you find yourself stretched, pulled and even contorted in all sorts of directions you never thought possible and if you don’t snap somewhere along the way, you actually stretch and grow so far beyond your perceived limitations and you emerge your own personal super hero. I understand that you might not have seen my lasoo, but I am Wonder Woman by the way! Quite often, I at least, find myself thrown in the deep end, way out of my depth on these adventures. Thrashing my arms around in the swirling vortex, I feel myself about to go under and yet I somehow find my strength and go on to exceed even my wildest expectations. Amazingly, the frightened little mouse emerges from her ordeal a lion, even if my roar is still a little soft. Given my struggles with my autoimmune disease which attacks my muscles and lungs, these challenges can be terrifying and intense. However, my fear is counterbalanced by my intense desire to be an active part of our family and be able to do things with them. Sometimes, these challenges involve relatively simple things like taking the dog for a walk, walking to the shops or being able to go the park after the school. However, every now and then some big challenges come along and it doesn’t get bigger or more terrifying for me than our annual ski holiday. The rest of the family are mad skiers who have been checking the snow reports for a few months now and started crossing down the days to our next ski trip as soon as they exited the slopes last year as green oases were opening up and the alpine streams were flowing fast. 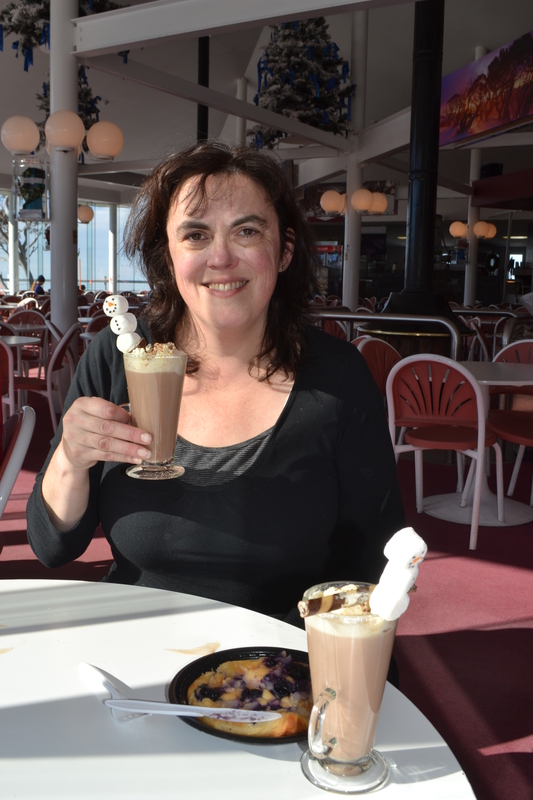 Enjoying a Toblerone Hot Chocolate at Mid-Station, Perisher. 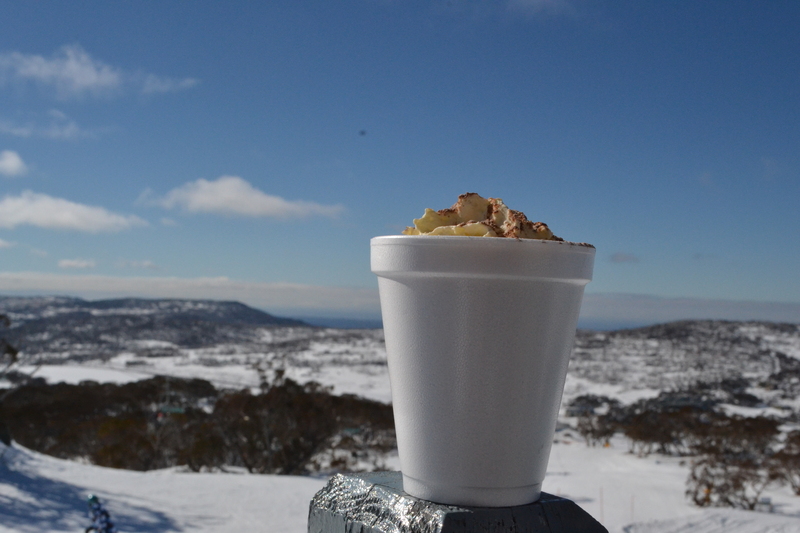 I, on the other hand, prefer traveling up and down Perisher’s Front Valley on the chairlift, stopping off at mid-station for a decadent Toblerone Hot Chocolate served with a marshmallow snowman on a swizzle stick and walking through the snow taking photos. However, there was also something about the allure of skiing which sort of drew me in…no doubt, seeing how it made the rest of the family glow! Two years ago, we took the kids skiing for the first time. They, and of course, my husband had a mad time and came home totally ski obsessed. I didn’t go skiing that time thinking that it wouldn’t be possible. This idea was challenged when we met the para-olympic ski team training down there and they put me onto the Disable Winter Sports’ Association. I don’t use a wheelchair and so there are some things they can do that I can’t. I wasn’t sure if I’d make it down the hill in a sit chair and didn’t think I’d ever be able to pull off conventional skiing until I met my instructor. Yet, this meeting provided the initial spark. Thank goodness you don’t have to take on the mountain alone! This spark grew into something of a determined flame. I was going to turn my mountain around. Instead of climbing up the mountain like so many garden-variety adventures, I was going to do my own thing and ski down the mountain instead. I was initially going to do it as a fundraiser but in the end decided that it was too much to organise and that I was better off just making sure I reached the bottom on the mountain. You could just imagine organising some kind of huge event and then being too scared to go down and instead of being the all-conquering hero, being rescued rather red-faced by ski patrol in the ski-do. Anyway, you’ll read in a previous post that I actually made it down to the bottom of the mountain. Of course, I didn’t feel like the conquering hero at the time. I was too busy shaking in my boots and relieved it was all over. Yet, I’d done it. I had conquered the mountain!! However, instead of this achievement being the finale for what had been an amazing year of personal achievements, it actually signalled the beginning of a serious fight to save my life. 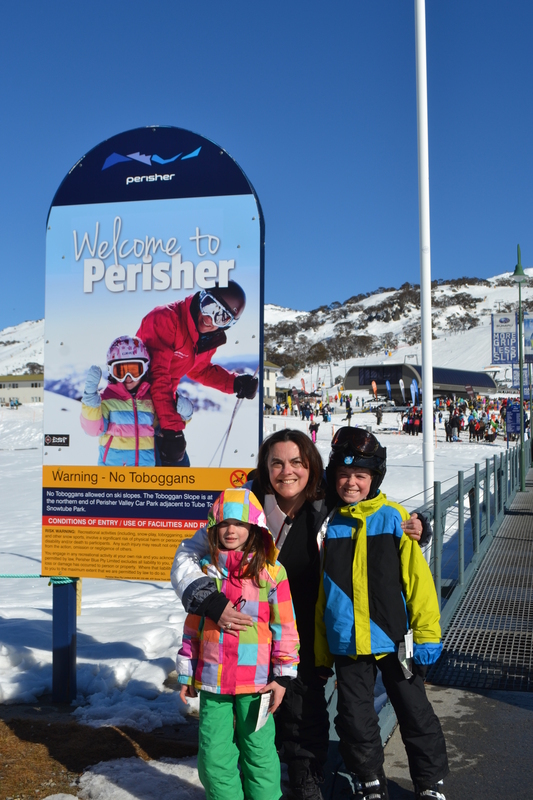 While down at Perisher, I developed the beginnings of the chest infection which developed into pneumonia and this pneumonia became seriously life-threatening. My lungs were almost cactus according to my specialist. The pneumonia meant new CT scans of my lungs and these showed that the scaring or fibrosis associated with my auto-immune disease had progressed and was now “established” not “mild”. This development resulted in some very serious medical appointments but then I was offered chemo which, at the time, felt like a life raft to a drowning soul. The chemo worked but it has been a long road and I’m not back yet. Lungs have improved from 43% (the worst was unrecorded) to 60% and my lung specialist was “impressed”. I don’t think he’d expected that. My muscle strength is also pretty good. Most of the problems I had relating to my auto-immune disease have improved significantly but ironically I’ve been battling “chemo brain” and have dreadful troubles with my memory and any sense of time. Multitasking of any sort is impossible. I am dependent on lists, alarms and the occasional cattle prod from Geoff, the kids or the pile of school notes. After going through all of that and I must admit that I somehow successfully managed to squeeze my violin exam and Christmas in between it all, I am rather apprehensive about returning to the snow this year. I remember all those awful out of control feelings as my skis took off seemingly well ahead of my body and the absolute nail-biting horror of looking out from the top of the mountain and seeing the village way, way down below. I felt like I was perched on the very edge of the world about to fall off. Do I really need to go through that level of fear all over again? Isn’t doing it once and knocking it off my non-existent bucket list, enough?!! Of course, I have replayed that horror over and over and over again as I prepare for my return to the mountain. As much as I feel like letting that fear engulf me and running as far away from the mountain as my ski boots can carry me, I’m also determined to show that mountain that I mean business. That it’s not going to get me again. I can beat the mountain and I can also take out the muscle disease, the dreaded lung disease and I am going to be so much more than a survivor. I am going to be an almighty conqueror. I’ll put in a little prayer request at this point because I need to acknowledge the one who is the wind beneath my wings. I know prayer has helped to get me where I am and I’ll certainly need it as I conquer the mountain again! Out walking the dog preparing for our ski holiday. So I ask you to think of me as I keep walking the dog to get myself fit for this latest challenge on my journey. I have already taken so much more than the first step. I have conquered the mountain before and now all I need to do is go back. That is what it means to be brave! PPS. I should point out that while I am more afraid of tackling the mountain this time because I have been down there before, at the same time, I have been able to reassure myself that I am in pretty good physical shape and I can also reassure myself that because I’ve done it before, I can do it again. I will also have my instructor to help me. It’s great to know that we don’t have to conquer our mountains alone. 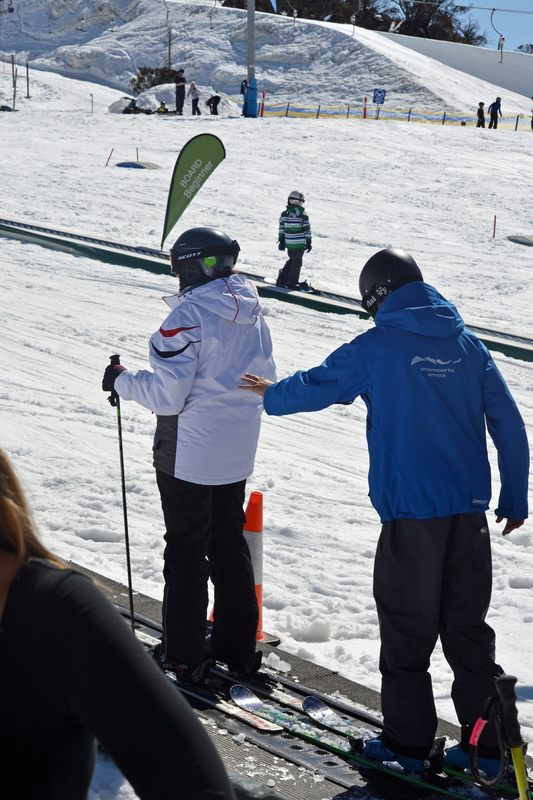 I am also looking forward to skiing more with Geoff and the kids hopefully beyond the learner’s magic carpet this year. Gee…now I really am starting to sound like Wonder Woman and I might even confuse myself. This entry was posted in Chemotherapy, Christianity, Health, Parenting, Skiing, Travel, Uncategorized and tagged chemotherapy, dermatomyositis, disability, family, God, healing, Jesus, kids, lungs. 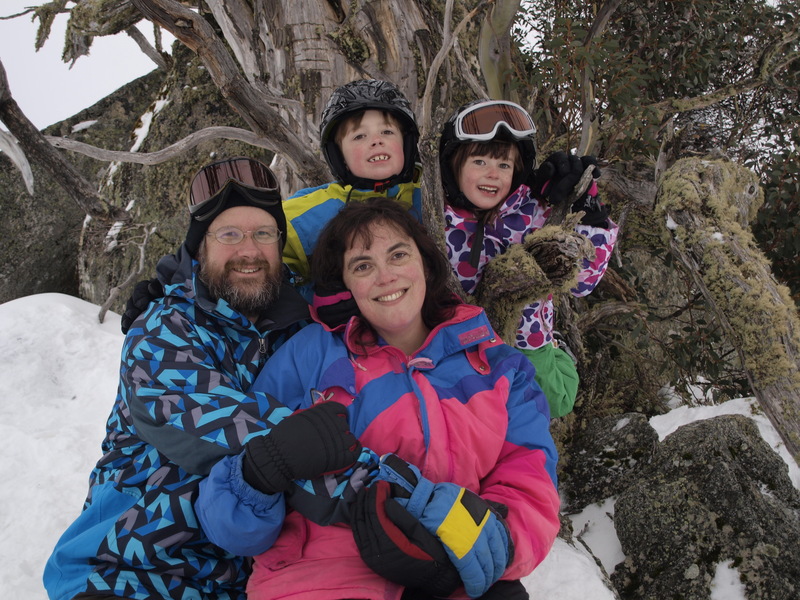 Institial Lung Disease, parenting, Perisher, skiing, snow, sport on August 17, 2014 by Rowena. 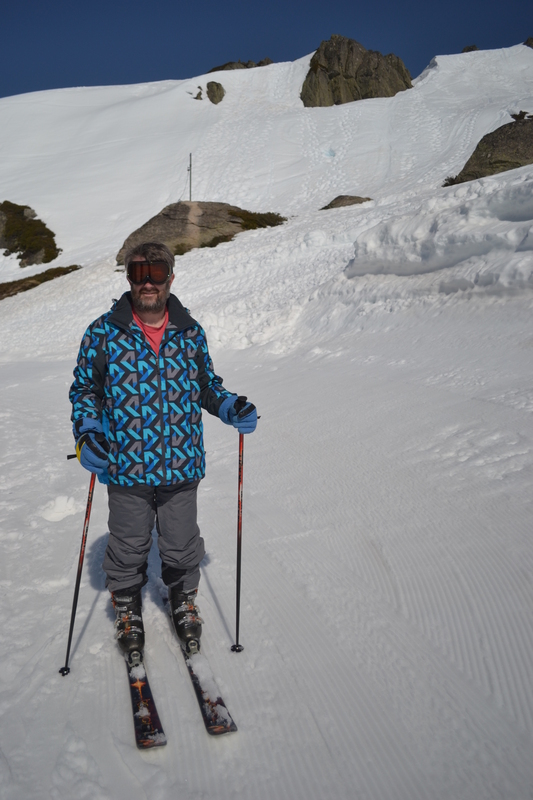 This entry was posted in Chemotherapy, Skiing, Travel, Uncategorized on August 17, 2014 by Rowena. The Journey of a thousand miles begins with a single step but then you need to keep walking…and walking… and walking. About a month ago, I started walking the dog along the waterfront a few mornings a week. While being able to take the dog for a walk is something many take for granted, for me it represented a humungous breakthrough! Having a muscle wasting disease which goes in and out of remission like flicking a switch, going for a walk is no longer something I take for granted. It is often a luxury, something I need to work hard at or indeed, it can also become a fairly risky activity. It would actually be safer for me to jump out of a moving plane as long as I had a parachute attached. However, every time I read anything related to improving my physical and emotional health, exercise is always top of the list. Being the middle of winter, walking is the best form of exercise for me and our Border Collie Bilbo is only too keen to join me on the journey. 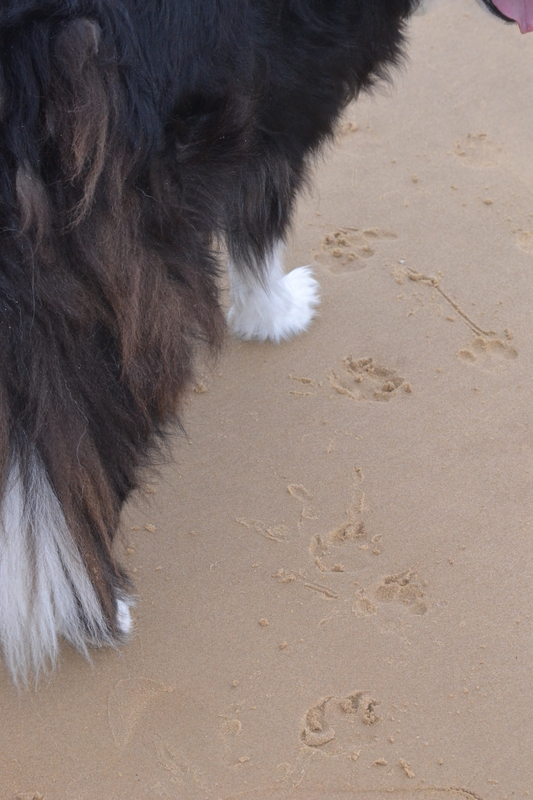 The journey of a thousand miles, begins with one paw print in the sand. So far we’ve stayed local. 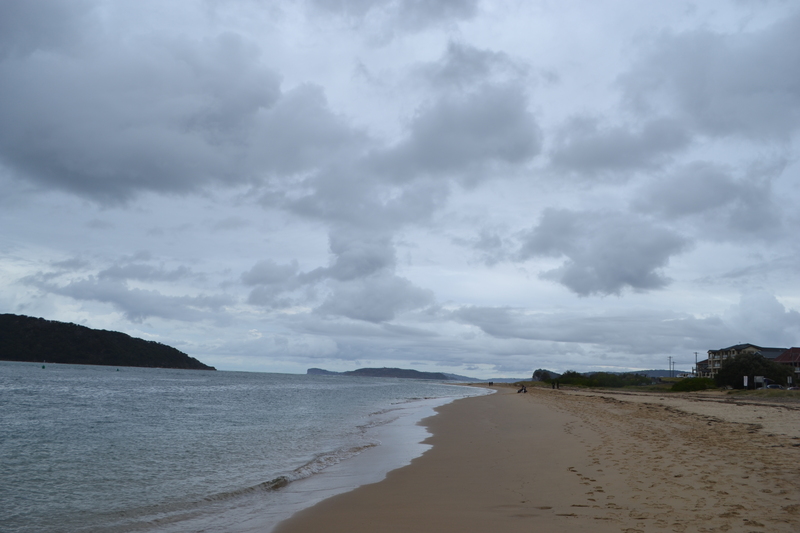 We drop the kids off at school and head for the beach which has an excellent new footpath without any of those menacing cracks, which can be very nasty indeed which to the mobility challenged. The footpath monster has jumped out and grabbed my foot with its malevolent grip more than once before and I’m sure it was laughing as I fell crashing against the concrete with blood spurting skywards like a fountain. Footpath monsters are nasty psychopaths who can’t even shed a solitary tear for their innocent and often mobility-challenged prey. Most people come here for the view. I’m here for the footpath. Walking has really helped lift my mood and help me better deal with my lingering health issues. Not only do I benefit from all that “scientifically-proven to be good for you” stuff like endorphins but I also get out of the house, soak in and explore the view and meet loads of people. I make a point of saying hello to everyone I walk past. This is my personal rule and most other walkers do the same. Most of the time, there’s just a: “Good morning” along with perhaps a comment about the weather: “freezing”, “sunny” nothing much more. Naturally, everybody’s response is different but some people really do respond with a heart-warming smile, which stands out and resonates from the rest. Even though they’ve only said: “Good Morning”, I feel uplifted. While the majority of people down at the beach are a motley crew of walkers with and without dogs, there’s also a foreign species in our midst…the exercise fanatic. The exercise fanatics jog or even run along in their Lycra skins with a water bottle strapped to some part of their anatomy and almost mandatory headphones over their ears. Of course, they don’t stop to say hello, wave or pat your dog. Rather, they’re pretty much in their own little worlds no doubt listening to music to try to block out the physical torture. Personally, I can’t imagine anyone enjoying jogging although I understand there are plenty of addicts out there. I’m simply not one of them. Stop it, Ro! Behave yourself. Show a bit of respect. Anyway, as I said before, due to my muscle disease, I am overjoyed just to be able walk at all. Get out of the house. Never take that for granted. As much I protest and claim to deplore exercise, I have noticed a huge mood shift since we’ve been going for our morning walks. Of course, there are the endorphins but we’re meeting people chatting with other dog owners and of course meeting their dogs and giving my post-chemo brain two new names to forget instead of one! We’ve now become part of the dog walking community. I love this because I’m quite a social butterfly but I’m also trying to be productive and get something done. You know how it is. I’m trying to focus on working from home (my writing) and get the house sorted out and organize the kids and often recover from their morning antics (battles over iPads, refusals to eat, eat dressed and wondering how supposedly intelligent children can’t close the front door behind them without at least a reminder…or 10!) This way I can get some exercise. Have a chat and can be sitting at my desk by 9.30 AM. I feel cold just even looking at the photo. The sky was icy white with barely a shade of grey. A few days ago, I was seriously struggling to get motivated for our walk. The day beforehand, it had been windy, raining and absolutely bleak and freezing. This particular morning, the weather wasn’t looking any better and the entire sky was coloured-in a very pale and chilly shade of grey. To be honest, I was seriously thinking of just going straight home, diving back into bed, switching my electric blanket onto super roast and hibernating for the day. A warm bed on a cold day seemed to extinguish any thoughts of persistence, perseverance or any other motivational rubbish. However, I heard a small voice somehow whispering to me through the wind telling me to get out there. Saying that even if we only go for a short walk, that would be better than nothing. I wouldn’t be surprised if the dog was exercising his powers of telepathy. Dogs are good at that…especially border collies. They might have been bred to round up sheep, but are just as good at rounding up people. Looks a bit moody but still good. Well, there I was walking the dog along the windswept, frozen beach. 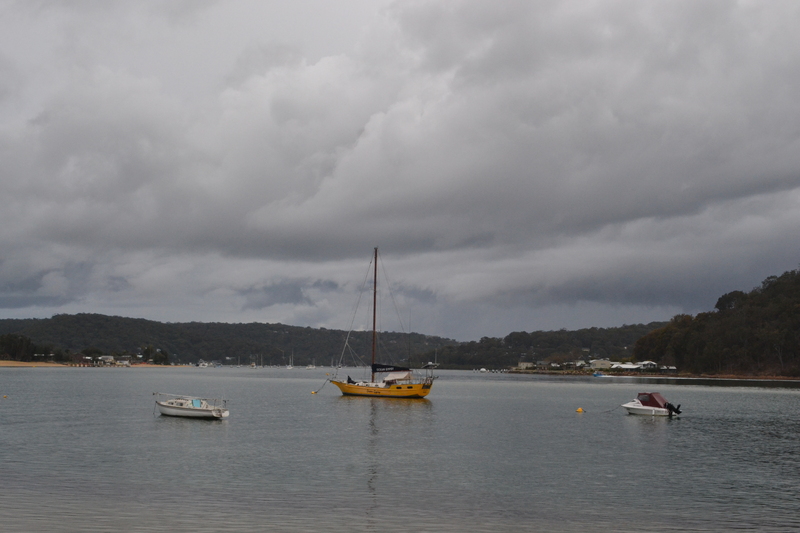 Of course, it was like a scene from a Jane Austen novel, except in an Australian context although the sun was valiantly trying to poke its head through the clouds. It was nowhere near as bleak as the previous day, which cheered me up a bit and we got underway. 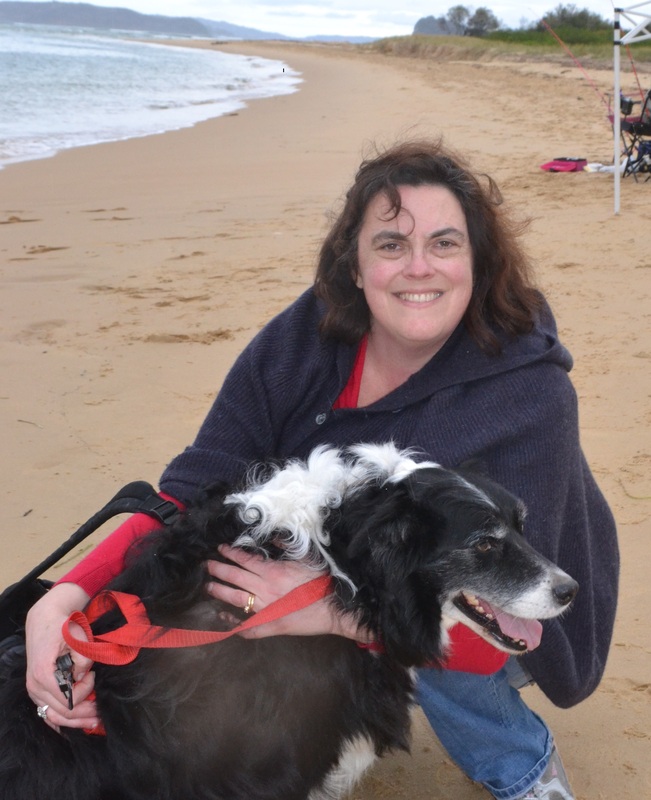 Further down the beach, we ran into our old friend Sam the Old English Sheepdog who is such a beautiful dog. I always feel like rushing up to him and giving him a huge hug because we used to have an Old English Sheepdog and I still miss him, even though he was a crazy mutt we’d rescued from the pound. 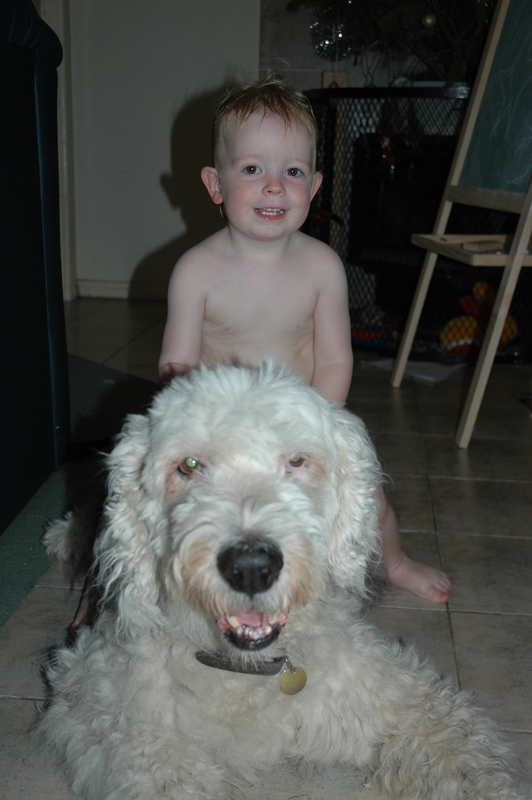 Our son with Rufus, our Old English Sheepdog, back in 2006. Anyway, it was Sam’s Dad’s birthday and a few dog walkers were all down at the beach drinking champagne and devouring the most lusciously sweet, hugest strawberries I’ve seen in awhile. The next thing I know, it’s 9.00am and there I am drinking champagne and orange juice and feasting on a strawberry with near strangers and being treated like a princess. It absolutely made my day!!! It was the best medicine I’d had in ages. Hmm…I’d never considered intravenous champagne as a treatment option before but it certainly has appeal. That said, I don’t really drink alcohol and it is the first time I’ve ever had champagne for breakfast. That’s why it felt so good. For once, Mummy was being naughty and I loved being in time out! 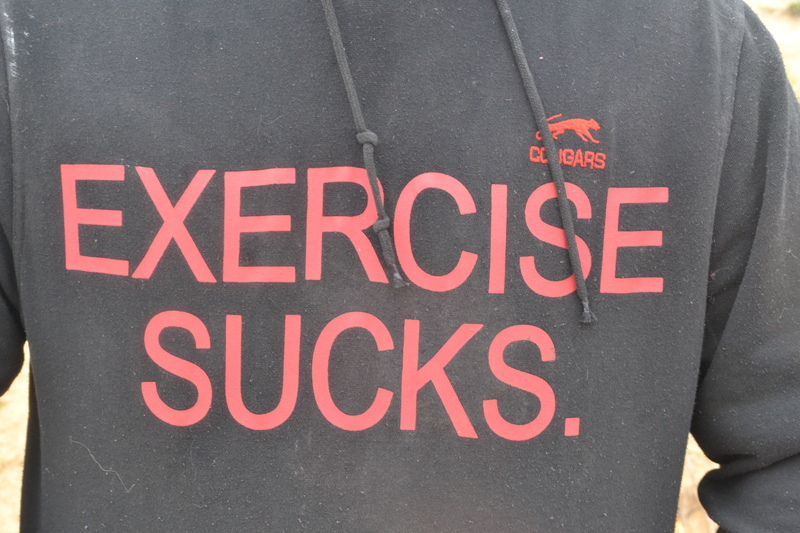 Have you been out exercising at all lately? Perhaps, after Christmas in July, there should be another round of New Year’s resolutions so all our best intentions can get another kick start. So I’ll keep an eye out for you bright and early in the morning hail, rain or shine and who knows what champagne will be waiting for us just around the corner?!! 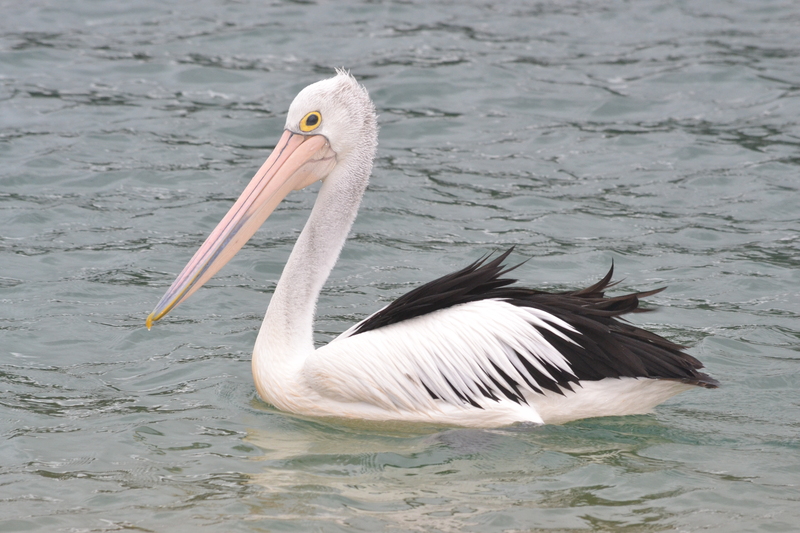 Look what I spotted at the beach today…another good incentive for getting out of bed and to keep walking! This entry was posted in Dog-Our dog Bilbo, Health, Humour, Uncategorized on August 17, 2014 by Rowena. Photo: Jack Mitchell, Wikipedia commons. This entry was posted in Uncategorized on August 15, 2014 by Rowena. Shock! Horror! My Kids Actually Eat! This afternoon I was so excited. I’d finally got something right.My two little cherubs were sitting down at the kitchen table eating their home-made Pumpkin Soup with fingers of wholemeal toast and they couldn’t get enough. Alleluia! Talk about a breakthrough! Most of the time, getting our kids to eat anything seems to be a nightmare. That is unless it involves Tim Tams. We have breakfast nightmares trying to get our daughter to eat her Weetbix. 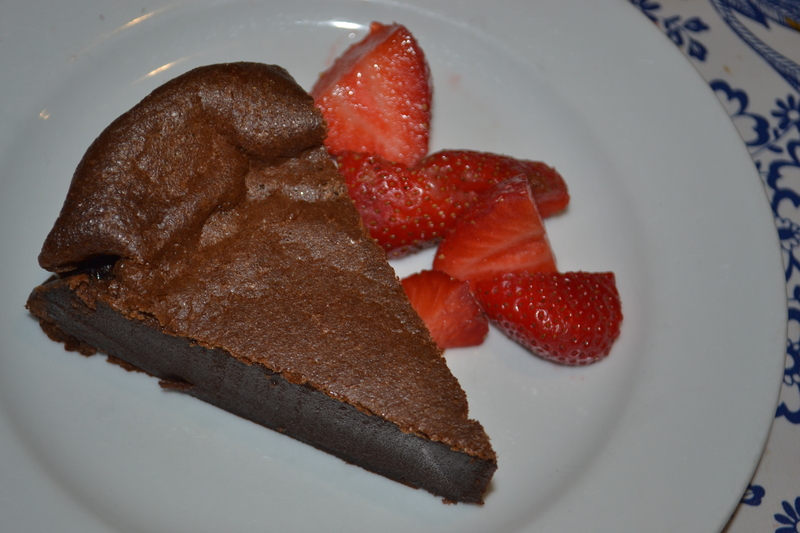 Lunch boxes returning home full.Rejecting Master Chef Matt Moran’s sumptuous Flourless Nutella Cake. Chocolate Chip and Macadamia Nut Cookies are even “yuck”. They are living proof that kids can survive on air. I can’t tell you how I’ve felt over the years having meal after meal rejected by my kids along with scrumptious cakes, biscuits. Pouring out my love as I cook, yet they reject it like poison. Not just the like of Brussels Sprouts but even chocolate chip cookies, chocolate cake although they do love Apple Crumble, Rice Pudding, pancakes and Butter Chicken. Parents, no doubt since the dawn of time, have been banging their heads against brick walls trying to get their kids to eat, feeding them stories of starving children in Africa or poor children whose parents can’t afford to give them any dinner whatsoever. I tell my kids that other kids only get tinned spaghetti on burned toast for dinner. They’re not given the likes of roast lamb with crunchy roast potato, sweet potato and pumpkin (roasted in olive oil, garlic, mustard and fresh rosemary-not lamb fat). However, yesterday after school, they both dived into the homemade pumpkin soup I had somehow prepared the night before like one of those TV cooking chefs with the teams of fairies living in their kitchens. This sort of thing doesn’t happen very often around here but I’m trying to lift my game and plan ahead. Have something healthy and ready to go when they get home from school so they don’t head for the biscuits in the pantry before I can rein them in. This is probably only the 3rd or fourth time that I’ve made Pumpkin Soup and I really am feeling rather slack for not making it more often. My goodness, here I am complaining about the kids not eating and here is a tried and tested favourite. They love it..particularly our son. He absolutely loves it and my mother has been feeding him Pumpkin Soup for years. I must say I find peeling and cutting up all the pumpkin rather tedious although I can’t quite get my head around making it Jamie Oliver style and leaving the skin on my butternut pumpkin. This entry was posted in Kids learn to Cook, Parenting, Recipes, Uncategorized on August 13, 2014 by Rowena.